Earlier this year, Chicago-land’s very own Edward Shanahan was nearly fined and arrested for conducting an unlawful business transaction on forest preserve property. According to the rules and regulations of the Forest Preserve District of Cook County any group or organization consisting of 25 people or more requires a permit and any admission charges to use Forest Preserve property may not be levied. That is why when the Forest Preserve Police caught word that Edward Shanahan was charging money to use Bachelors Grove cemetery as a tourist attraction, along with no permit being issued and unauthorized public advertising of the event, a police stakeout was possibly underway. Police questioned the owner of this web site about details of the event being advertised and full cooperation was given. Once all of the details were revealed to police and it was confirmed that no permit was issued, it was stated that a police stakeout was possibly required on the day of the event. Unfortunately, it was also revealed that unwitting patrons of the tour group that were to be driven to the cemetery using a tour bus under the guise of the Worth Historical Society would be fined as well. The fortunate outcome to the matter is that the tour was canceled due to excessive muddy conditions, although there were no such conditions on the day that the event was to have taken place, and that none of the patrons suffered at the hands of poor business practices. Further information reveals that John Stephenson may have tipped off Edward Shanahan to the stakeout due to his previous relationship with the owner of this web site. John Stephenson was later questioned on his possible involvement of giving advance warning to Mr. Shanahan of the police inquiry but denied any involvement. Mr. Stephenson, however, was later found conducting free tours of the cemetery that exceeded 25 persons, without permit, under the direction of Edward Shanahan. Furthermore, after speaking with a reporter of the Southtown Star, it was confirmed that Mr. Stephenson was correctly quoted in taking full credit for a clean-up of the cemetery in 2009 supposedly using 100 of his web site members while never mentioning the Grove Restoration Project as he had claimed to have done before the article was released. These two particular statements were clearly false as there were less than 20 volunteers present, which was originally organized by the Grove Restoration Project, and less than a handful of John Stephenson’s members were present during the efforts. As if recent events surrounding Bachelors Grove cemetery weren’t strange enough, Mr. Stephenson was later interviewed on Edward Shanahan’s Internet radio podcast as “Mr. Bachelors Grove.” During the interview it was made clear not to visit the website of bachelorsgrove.com and that any records for Bachelors Grove cemetery were not readily available to the public unless you personally visit a historical society. To make matters even stranger, Mr. Bachelors Grove not only lacked correct information about the cemetery, but he did not have any historical documentation to cite on his website. Subsequent to the interview, you can now find information occasionally copied from bachelorsgrove.com and bachelorsgrove.net and posted to the forum at Mr. Stephenson’s website. At times the material can even be found incorrectly sourced as originating from himself. Traveling further into recent events are some of the invalid statements made by Edward Shanahan in a recent post to the Examiner. In the article it states that people are killing the vegetation by spreading herbicide and that Cook County is “selling” advertising space, among other statements. In a past discussion with John Stephenson he admitted to spreading the rumor as to the owner of this web site being responsible for spray painting areas around the cemetery, which is also briefly mentioned in the article. He declined an opportunity to apologize for the rumor, as well as the incorrect statements presented to the Southtown Star and intentionally misleading the public. So why does there appear to be so much hostility coming from a select group of so-called paranormal investigators and a ethically questionable “psychic reader” running tours-for-profit at the cemetery? The answers appear to fall upon the fact that Edward Shanahan can no longer make a direct profit off of the cemetery by running unlawful tours, money which has never helped the cemetery, and probably never will. 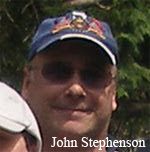 In addition, John Stephenson is upset that he could no longer take claim for something that isn’t true, as well as being upset over an audio clip released in which he stated that Edward Shanahan is a “Fake”, “Fraud” and “Phony” of his own belief, a recording in which Mr. Stephenson acknowledged as it was an EVP session during a visit to the area. In a twist of events, Edward Shanahan was clearly aware of these statements before his Internet interview with Mr. Stephenson in order to help clear up the rumors and facts surrounding Mr. Stephenson’s behavior toward the owner of this web site. As to why Mr. Shanahan would continue to associate himself with someone who makes claims that he is a fake and fraud remains highly questionable. Overall, is it possible that both Mr. Stephenson and Mr. Shanahan are simply acting childish in their behavior? Or is this another classic case of separate people feeding off of each other for their own selfish goals? Whatever each of their motives are for attempting to cause damage to the reputation of the Grove Restoration Project, the public has made inquires into these matters and it appears that those who wish to care for the cemetery are signing up more frequently despite the efforts of a few bad apples.